Meeting once a year in Friedrichshafen is a real pleasure and the opportunity to listen others' ideas, share experiences and discuss about common issues. So we did, but instead of waiting in the booth, the president went to the middle of the fair. Other activities, such as the EURAO's General Assembly and the ID-CCS7 workshop of DR@F for French operators, took place in the booth. Next year we will see there in June 21-23, 2019. The President declared: "2018 is a year with a lot of goals for EURAO! This is the reality that I came for the most important ham radio meeting in Europe. Of course some other hams may consider not very important the presence at Friedrichshafen since the most of the ham activities are ongoing in the other places around the world. Anyway, it is well known EURAO is preparing each year in a different way this annual presence at Friedrichshafen. 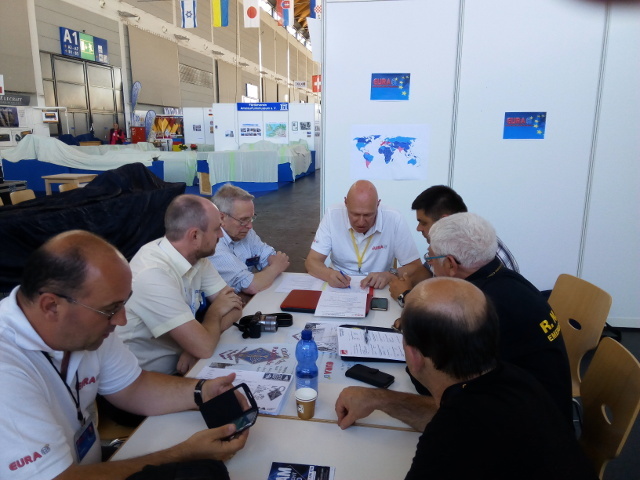 This year we preferred to make the step forward to be in the middle of the events and people also to visit the most important actors in ham radio lives instead to wait in a booth all day long to wait them to visit us. EURAO come to the hams to listen their needs and to talk about the best solution. I was well surprised to see the people know EURAO actions and from different discussions i can say the hams wants more innovation in the hams life, sport and laws for their activities. Exactly what EURAO are doing for hams. I use these opportunities to talk with hams about what they need to improve the hams lifes. Actually, Friday was a hard day. We received a lot of ideas. A nice surprise was to talking Saturday in the afternoon whit Alain ARTERO, TLD manager for EBU. Alain present a nice project and a brilliant idea in to preserve our domain. We will find a solution to support him in to make steps forward. In the flea market a lot of hams congratulation us for the implication in to hams activities also for a clear and strong opposition for the unchanged chance from the other side. If we are talking about ham radio spirit I can say about some of hams that even they are thinking they are for sure they has no connection with HAMSPIRIT. Maybe little more reality for them is not a bad thing. Hi! Our visits were used to spread QSLs too. This ancient heritage of hamradio is very important to our hams but i was not well surprise to see how hams use QSL to black mail hams around the world. This issue has to be solved as soon as possible. To be honest who think about QSLing is a proving force has to reconsider what mean hamradio. The time is the best friend of us!"